Three prominent Cardinals from the Whitey Herzog era _ Willie McGee, Tom Pagnozzi and, yes, Ozzie Smith _ thrived under Tony La Russa in his first season as St. Louis manager. Though Smith got upset with La Russa because the manager reduced his playing time in 1996, relegating him to a reserve role behind shortstop Royce Clayton, what gets overlooked is Smith produced a quality final season under La Russa’s management. After Joe Torre was fired in 1995, La Russa was hired to manage the Cardinals in 1996. Pagnozzi and Smith were holdovers from the 1995 Cardinals. 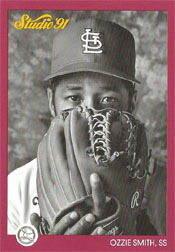 McGee returned to the Cardinals as a free agent after spending the 1995 season with the Red Sox. After spring training in 1996, Smith was slowed by a hamstring problem and Clayton established himself as the starting shortstop. The decision to put Smith in a secondary role created a rift between La Russa and Smith. Unlike Smith, McGee and Pagnozzi built respectful relationships with La Russa in 1996. Like Smith, McGee and Pagnozzi performed well under La Russa’s management that year. _ McGee batted .307 for the 1996 Cardinals. It was his highest batting average in five years. McGee also led the 1996 Cardinals in pinch-hitting batting average (.350, 14-for-40). _ Pagnozzi produced single-season career highs in home runs (13), slugging percentage (.423) and runs scored (48) for the 1996 Cardinals while elevating his skill as a pitch caller. Pagnozzi batted .270 in 1996 and especially was effective (.311, 56-for-180) with runners on base. _ Smith, who was 41 during the 1996 season, hit .282 that year. He started 50 games at shortstop and otherwise was used primarily as a pinch hitter. He hit .351 (40-for-114) at home under La Russa’s management.